This book is being strongly recommended by Bill Gates, so I thought I ought to read it. But I also think that some of the anti-enlightenment rhetoric we hear is a prime example of muddled thinking, often along the lines of 'Enlightenment values are all very well, but someone didn't live up to them, so they don't count'. I'm hoping this book will help to show what we can do to counter such muddled thinking, as well as showing whether there have been any serious arguments against enlightenment values. There aren't any samples from the usual sources as the book hasn't been published yet, but you can download a free chapter at b-gat.es/2GsBQIQ. This chapter, Progressophobia looks at responses to Pinker's earlier book The Better Angels of Our Nature. It seems that people don't so much present counterarguments as present a psychological inability to accept the many ways in which the world is improving. 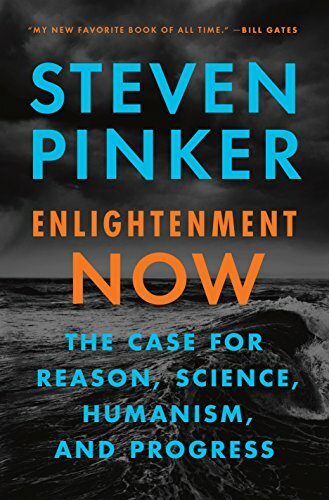 Of course writing a new book to deal with objections raised against a previous one is a natural way of proceeding, but I'm also interested to see what else Pinker has to say about the progress of Enlightenment values. It seems I'll have to wait until the book is published to get an idea of what new topics it covers. Now that the book has been published I've read the sample (I read the Kindle sample on Amazon UK, but the Kindle version doesn't seem to be available in the USA yet). The first chapter was more about the enlightenment, but made it clear that progress wasn't automatic - we must beware of going backwards. The second chapter introduces the reader to entropy, evolution and information. I have my doubts about this - the study of such things is of course an important result of enlightenment values, but to base arguments about society on them seems excessively reductionist. In chapter 3 comes out fighting against Counter-Enlightenment ideas, but I can't help feeling that he strays too far towards dogma himself, rather than encouraging dialogue. I'll have to see how this pans out in the rest of the book.